← Have Goals? Start the New Year with a Promise to Yourself! As has been explored in the previous articles (Part 1 and Part 2), there may be various possible dynamics at play in our relationships with our goals. “Sometimes We Run…” is a metaphor that illustrates some of the ways we relate to them. So far, we have discussed that sometimes we run away from our goals, sometimes we run toward them, and that one of the most compelling ways of running is when we are simultaneously running toward something and away from something else. But this is not all there is to say about the ways in which we run, the ways in which we pursue success, accomplishment, and the positive things in our life. There are a few other positive ways of running as well as some that are problematic. First, I will deal with three ways of running that end up sabotaging us, do not work for us, or are just not congruent with the nature of who we are. Then in the next installment, I will talk about a couple more positive ways or aspects of running. 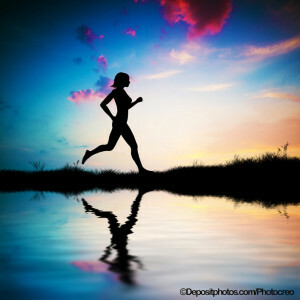 Running is much more effective when you are doing it for yourself, when you are doing it to accomplish what you want in order to achieve your own goals. But often, we acquire expectations from our parents or from others and end up running to fulfill what they think we should do. This manner of running can foster resentment and promote sabotaging ourselves in various ways, sometimes without even knowing that we are doing it. Running to fulfill another’s expectations often does not sit very well, especially when you look back and reflect on what you have done and the effect these types of choices have had on your life. Often, running to fulfill another’s expectations ends up creating life crises later on. The people who are most effective at progressing toward their goals are doing it because of decisions they have made for themselves, serving their own expectations and desires rather than those of somebody else. Certainly, running to fulfill another’s expectations may get someone to succeed and may be compelling for some people, but the question is, what does this become later on? It does not feel good looking back and feeling dissatisfaction that you pursued a less meaningful path than you could have. This often happens when one pursues goals based on another’s expectations, rather than by personal choice. Of course, sometimes the situation is more complicated. Sometimes we adopt expectations that may have originally been someone else’s and take them on as our own. This is fine, and is not a problem, as long as these expectations are genuinely taken on as your own and become your own. Certainly we are social beings, and have expectations placed on us. “You are my son/daughter and you will be a doctor,” for example. But it is whether these are congruent with who you are and where you want to go that matters. The fact that a goal may have originally come from somebody else is not as important as whether you ultimately take it on as your own. Beware of whether you are running to fulfill another’s expectations. Reflect on this and consider whether your goals are what you really want yourself. Clarity in this regard will help you move much more effectively toward your goals. Running without shoes is typically not a good idea. While it may feel good to feel the grass beneath your feet, most likely there are going to be pebbles, rocks, bumps, or sticks that are going to make running without shoes very uncomfortable. Running without shoes is much like going toward your goals unprepared, doing things prematurely, not assessing the reality of what you need or what competencies must be developed in order to prepare yourself for moving toward them. Part of defining goals is knowing what you need and what equipment you will need to take with you. Without considering these factors first, the chances of bruises, cuts, and injuries that could prevent you from moving forward further are very possible. So wear your shoes, and wear the right shoes. Often in setting goals, part of the process involves picking out the right shoes, being sure that you are prepared for the journey, and being sure you have some of the requisite competencies. Developing some of these can simply be integrated into your goals. To prevent the pitfall of running without shoes, it is important to spell out what we need and then work on moving toward getting it. Often it is a matter of breaking down our goals and our plan into smaller steps to ensure that we are prepared for the journey and can continue to acquire whatever necessities arise along the way. People in this pattern run and run in a frenetic fashion, often without a clear destination or without clear goals, simply running because of feeling uncertain or just being afraid to stop. This is really a typical workaholic pattern. Here, the motion, the movement, the continued activity becomes an addiction, and often what you are really afraid of is not completely clear. You just have the compelling feeling that you need to keep going. Oftentimes this is related to running in circles, because you frequently may just keep moving and lose sight of the plans, goals, objectives, and all the details that need to be attended to, or only focus on the details without having a broader perspective of what you are doing and why. Typically, a fear of stopping in some way influences the pattern of running in circles. Clearly, running because you fear stopping is not a very productive pattern. Some reflection and examination of your own behavior and what you are doing and why is important in order to stop this pattern. Thus, in this installment of “Sometimes We Run…” I have gone over three unproductive manners of running, three unproductive ways of being in motion in the world, three unproductive ways of manifesting so-called “goal-directed behavior” in your pursuit of the things you want in life. I suggest that you reflect on your own behavior and what you are doing. Does what you are doing relate to some purpose, some higher meaning, some higher aspiration that you are moving toward? Is the decision to pursue that your own or someone else’s? This entry was posted in Achieving Goals and tagged achieving goals, enrichment, goal setting, goals, personal growth, self-improvement, success. Bookmark the permalink.